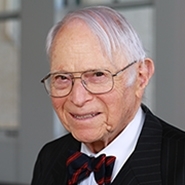 SAN FRANCISCO, CA (June 20, 2005): Farella Braun + Martel is proud to announce that the Ninth Circuit has bestowed its highest accolade on Jerome “Jerry” I. Braun, one of the firm’s founding partners and a noted San Francisco attorney. Braun was selected the 2005 recipient of the Ninth Circuit’s John P. Frank Award, recognizing an outstanding lawyer practicing in the federal courts of the western United States. Braun will receive the award on July 18, 2005 during the open session of the Ninth Circuit Judicial Conference in Spokane, Washington. Braun is being recognized for a distinguished career spanning more than 50 years and for his significant contributions to legal, community and educational organizations. Mr. Braun maintained a diverse trial and appellate practice in areas such as complex commercial litigation, securities regulation, antitrust and legal malpractice. He currently concentrates on federal practice. He has served as an arbitrator, mediator and as a special master for the federal courts. He is a Fellow in the American Academy of Appellate Lawyers and in 1999 received the esteemed American Inns of Court Professionalism Award. He is a former member and chair of the Ninth Circuit Senior Advisory Board, and is a member and past president of the Ninth Judicial Circuit Historical Society, where he raised most of the funds for the youth-directed biography of the late Judge Cecil Poole, “A Life in the Law.” He is a past president of the California Academy of Appellate Lawyers and a former trustee of the San Francisco Bar Foundation. He chaired a special bar association committee that studied the question of whether the Ninth Circuit should be split and was vocal in his opposition to any division of the court. His community contributions include serving as an officer and a director of The Other Bar, an organization designed to help alcoholics in the legal profession. He also is the founder, president and co-director of The Other Road Foundation, a non-profit group that underwrites treatment for recovering alcoholics. He has served as a director of the San Francisco Jewish Home for the Aged, Council of Jewish Federations and Welfare Funds, and as past president and director for life of the Jewish Community Federation. Braun has authored numerous articles in professional and scholarly publications and serves as editor of the Appellate Advocate for the American Academy of Appellate Lawyers. He was an instructor at San Francisco Law School and a visiting instructor at his alma mater Stanford University School of Law, where he helped establish the John Samuel Abramson Scholarship Endowment for minority students and the Judge Robert F. Peckham Scholarship Fund. The Ninth Circuit consists of the Ninth Circuit Court of Appeals, and the district and bankruptcy courts and related court units for the Districts of Alaska, Arizona, Northern California, Central California, Eastern California, Southern California, Hawaii, Idaho, Montana, Nevada, Oregon, Eastern Washington, Western Washington, the U.S. Territory of Guam and the Commonwealth of the Northern Mariana Islands.